Aspects of your life getting you down? Andrew Warnes was selected from thousands of Psychics in Australia in 2011 to audition for the Australian television show “The One”. 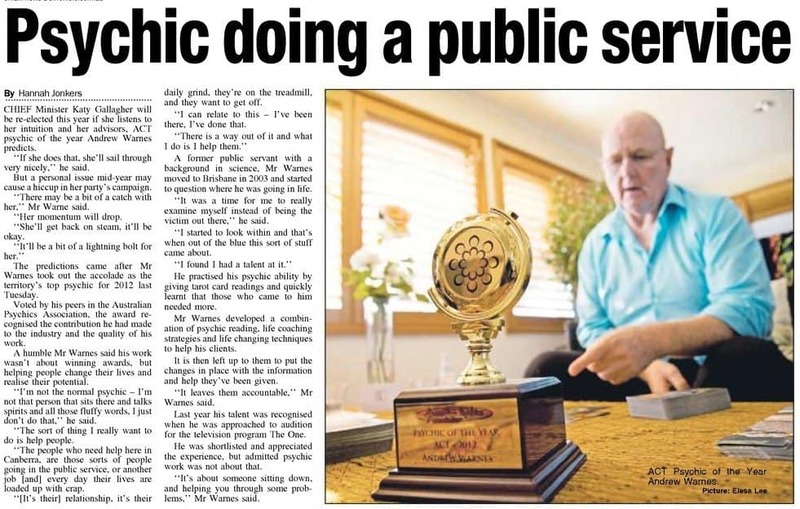 In early 2012 he was awarded the coveted Psychic of the Year award. 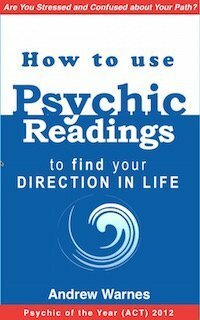 Andrew is a highly sought after Psychic with clients from Australia and all over the world. He regularly helps National and International decision makers. Are you prepared to do what it takes to get what you want? Andrew offers a unique approach when doing his readings. He is a specialist tarot reader combining a combination of a glimpse into the future with step-by-step guidance to achieve the best possible outcome for you. His method is straight-to-the-point with a smattering of personal development to give his clients a strategy to change small things in their lives. Andrew knows that small transformational changes lead to complete changes in direction over longer periods of time. Andrew’s readings can be brutally honest. He tells it as he sees it and warns his clients that they might not like what they hear. Do you need support to take charge of creating the life you’ve always wanted? Coming from a Public Servant’s background, Andrew knows very well that ‘dead end’ feeling many of us have at times. From the experiences on his own journey, he is well placed to know and understand how to integrate readings and mentoring for lasting change. 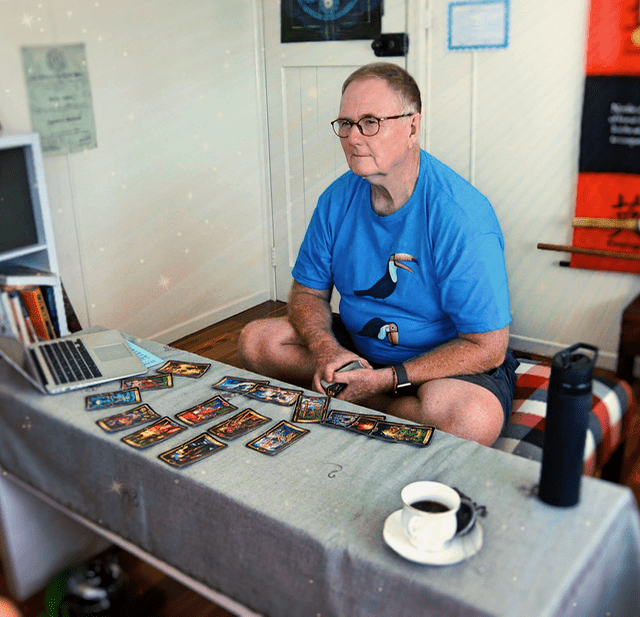 He conducts his reading business from home in New Farm by doing face-to-face readings, as well as Skype and telephone sessions. He trains people in psychic awareness by using Tarot as a training tool, regularly running courses. Andrew currently lives in Brisbane, Australia. 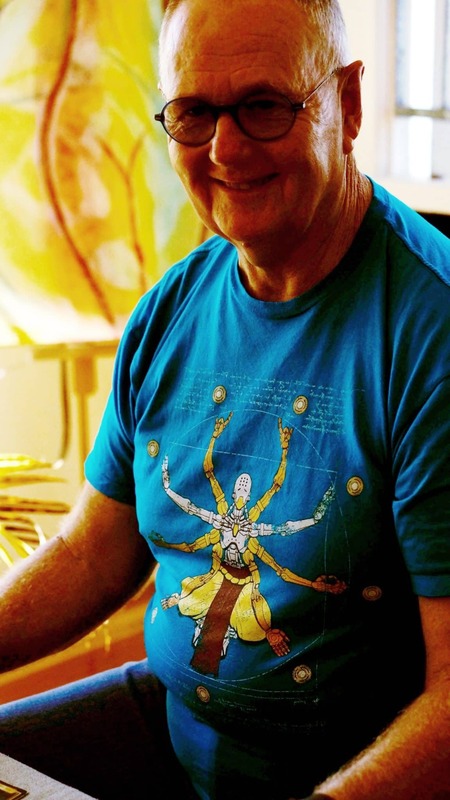 He enjoys his daily fix of Aikido martial arts, a walk, a morning coffee and a community chat. 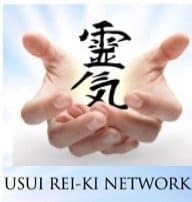 He uses the simplicity of his life to renew his mind and spirit and above all, testing his mind by mindfullness mediation and physical activities. Andrew is based in Sunny Central Brisbane in New Farm, Queensland, Australia. He works with clients all around the world.